If you've been following this blog for a while, you've probably noticed that I a big fan of Disney history. Thanks to podcasts like Wedway Radio and WDW Radio, I've learned a LOT but, just like other obsessions interests, I want to learn more. Several months ago, I purchased a biography of Walt Disney and I've finally started reading it! So far, I'm learning about Elias and how Walt and his many siblings were raised (in my mind, 5 siblings is a lot!). 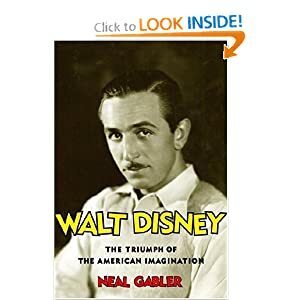 This is my first Disney bio, so I have nothing to compare it to, but I'm interested and can't wait to get back to reading!! Next on my list? 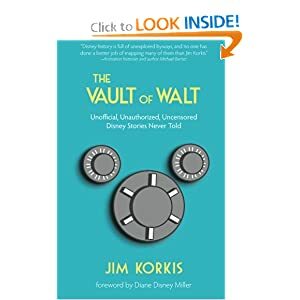 The Vault of Walt by Jim Korkis - if you listen to podcasts, you've probably heard him. Full of great stories! And no, I don't get paid by Amazon, I just linked in case anyone was interested! Anyone else interested in the history of how it all came to be? The Bob Thomas biography was really good. I finished that a couple of months ago. Currently reading Since the World Began by Jeff Kurtti. There are so many layers to the whole Disney experience and that's one of the big reasons why I love it so much. Enjoy and I look forward to your reviews. The Vault of Walt is on my list, too! I love learning about Walt Disney. A few months ago, CNBC showed a documentary all about his life. I am hoping they replay it soon because it was an amazing show. I will have my DVR ready next time around! I will definitely be checking out these books!